Stan Lee’s Blood stolen! Erik Larsen attacks Christians! And DC gives everyone trunks! All this plus tons of drama from the world of podcasting, and much more so sit back and enjoy! 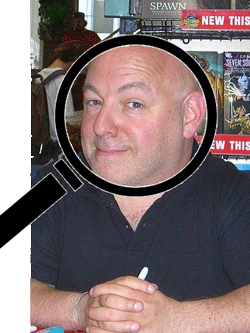 Brian Michael Bendis has been the dominant writer at Marvel for a number of years now. While his books — including Ultimate Spider-man, New Avengers, Avengers, and event books like Seige — sell well, they have also generated a fair amount of controversy and just plain complaints. Some people like his work, others don’t. For Tim, there have been high points, but much of it is just kind of there. Is it just me, he wonders? Is Bendis actually a good writer and just doesn’t always appeal to me? Or are there identifiable inadequacies in his work? Tim calls on a Bendis fan — Savannah College of Art & Design student and graphic novelist Josh Smith — and a Bendis critic — Comics Waiting Room columnist Vincent Moore — to discuss the phenomenon that is Bendis.